The latest song from the much-awaited film 'Kalank' is out. The song features Varun Dhawan and Aditya Roy Kapur together in the movie. What is surprising in the song is that it bonds Alia Bhatt's on-screen lovers together. The actress who manages to bring Varun and Aditya together in the song is 'Luka Chuppi' actress Kriti Sanon. Kriti features in a mujra performance. However the dance is not much like mujra. In fact when she appears first in the song, Kriti Sanon is surrounded by red lights, which indicate her profession. She however never goes over-the-top in showing her interest for the boys aka Varun Dhawan and Aditya Roy Kapur. Moving on, the rhythm of 'Aira Gaira' catches on to you in an instant. The lyrics are mediocre, but the line 'Ek mehbooba ki khaatir, aaj do do dilbar jaani' is quite interesting, considering both Varun Dhawan and Aditya Roy Kapur are smitten by Alia Bhatt's beauty in the film. The dance moves in this song are fair enough. Colour co-ordination of costumes has rather been taken special care of. The girls in this song are seen in a saree costume and all men wear a taqiyah (islamic cap, mostly used during prayers). Kriti Sanon, of course, shimmers in a saree and jewels in almost all possible parts of the body. Coming close to the glitz is Varun Dhawan's green sherwani. Aditya Roy Kapur looks sober and dapper in a black sherwani. 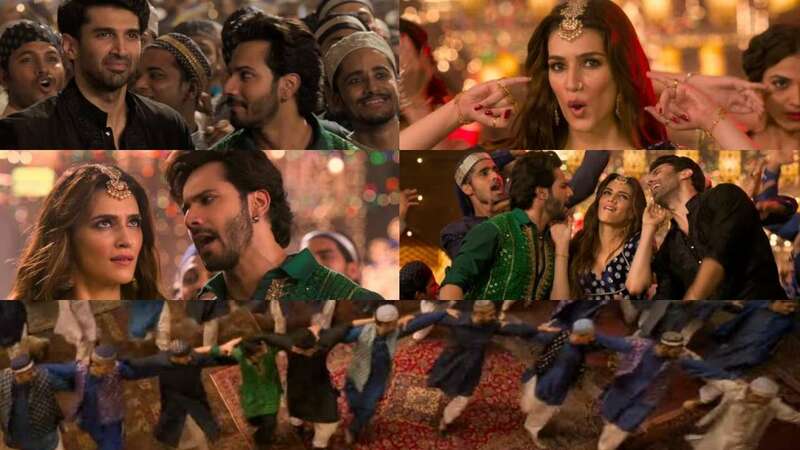 More than the choregraphy for Varun, Kriti and Aditya, what steals the show in the song is the way the synchronization of the Bhaijaan's coming together has been shot. The sets, of course, look grand and are also lit up for the occasion, giving out the festival vibes. Apart from Varun, Aditya and Alia, 'Kalank' also features Sonakshi Sinha, Madhuri Dixit Nene and Sanjay Dutt in lead roles. The movie will also feature Kunal Kemmu in a pivotal role. The 15-year-long wait of Yash Johar's dream is finally coming to theatres on April 17. The movie is helmed by Abhishek Varman and is produced by Karan Johar, Sajid Nadiadwala and Fox Star Studios.